All Prather homes currently listed for sale in Prather as of 04/18/2019 are shown below. You can change the search criteria at any time by pressing the 'Change Search' button below. If you have any questions or you would like more information about any Prather homes for sale or other Prather real estate, please contact us and one of our knowledgeable Prather REALTORS® would be pleased to assist you. "Absolutely stunning private home with 4 bedrooms and 3 1/2 bathrooms! Enjoy the private in-ground swimming pool with beautiful waterfall and the large back patio area for entertaining or summer fun! This wonderful home offers a lovely floor plan with a huge living area with great room flowing into the spacious kitchen and breakfast bar with Granite counter tops, built-in stainless steel appliances and convenient laundry room with utility sink and pantry. The carpeted bedrooms are light and bright with large closets. The master suite is a true retreat! Complete with private sitting/office area, walk-in closet and private patio access. The master bath offers a large vanity with double sinks, separate bath tub and shower. Wonderful details including easy care wood laminate flooring, high ceilings, ceiling fans and free standing wood stove with brick hearth. The 4.8+/- acres are loving cared for with back yard lawn area and nice landscaping. The attached 3 car garage has a man cave that's perfect for football parties and there is a detached workshop for projects and lots of parking space. 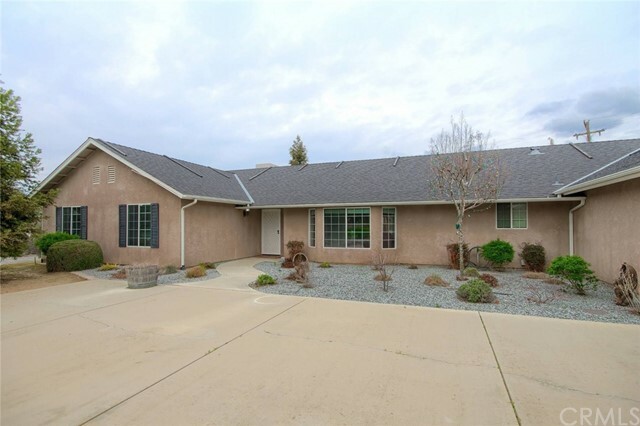 Great location for privacy but you are still close to Fresno, Millerton Lake and Table Mountain casino! This is a beautiful home and a fantastic opportunity!"